p>About The Courage StadiumEveryone knows the ground as Hayes Lane, despite it carrying the name of the brewers and it has been home to the club since 1938 when they moved from just down the road. It is a great non-league venue with a small main stand (with a fantastic bar at the top including a viewing area of the pitch) that sits around 4 foot above the playing surface. The stand was rebuilt in 1993 after fire destroyed the old one and it was named the John Fiorini Stand after xxxx. Opposite this is an excellent terrace that offers great views of the game, and behind each goal there are covered stands – one at the Norman Park end has benches which offer surprisingly good views. 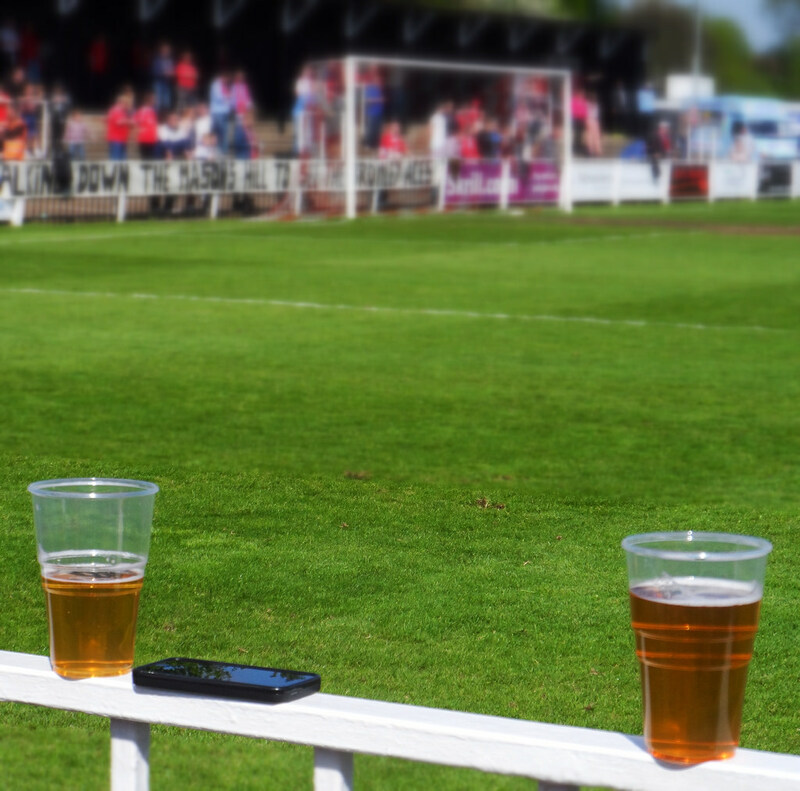 There is also a second bar next to the main stand where you can, shock horror, buy beer and drink it whilst watching the game!How to get to The Courage StadiumThe ground is a fifteen minute walk from Bromley South station. Simply head right out of the station, cross the road and walk down Westmoreland Road, taking the first left into Hayes Road and following this all the way down to Hayes Lane where the ground is opposite you. Alternatively a number of buses run past the ground including the 314 from Eltham, 146 from Bromley Town centre and 119 from Croydon.Getting a ticket for the Courage StadiumSimple £12 for Adults and £6 for Concessions, paying on the door. The club do deals for families as well, offering free entrance for more than one child.Our last visit – May 2014“It’s a marathon not a sprint”. The favourite line of football commentators, players and managers when they lose a game during the season. The season isn’t won or lost over 90 minutes but over the course of nine months. Technically that is true, but when it comes to play off time, then the previous efforts go out of the window and it all comes down to ninety or in some cases, one hundred and eighty minutes of football. The end of season play offs are the high point of the season. Two teams essentially fighting like gladiators in the Coliseum. Only one can walk away a victor, battered and bruised ready for the next opponent, whilst the loser has nothing but memories of a successful league campaign that ultimately led to nothing to console themselves with. People who say the play-offs are unfair are either a) play-off losers or b) anti-football fans. Yes they are incredibly harsh sometimes. Take FC United of Manchester. In with a shout of the Evostik Premier title until the final day of the season, they finished 16 points above 5th place Ashton United this season, yet in front of nearly 3,000 home fans this week, they lost in extra-time. Their dream of moving up to the Conference North for the first time in their history was dashed by a 120th minute goal by Ashton’s Jack Higgins. In the Ryman Premier League, the teams finishing 2nd and 3rd, Bognor Regis Town and Kingstonian respectively, both lost their home play off matches this week. I can still remember the pain of 2004 in Cardiff when West Ham lost to Crystal Palace in the Championship Play Off final. Palace had come from nowhere to sneak into the play offs at the last gasp and feeling the injustice of the fact that without the play offs we would have been promoted in third. The following season it was our turn to sneak in at the last-minute and were promoted after beating Preston North End having finished twelve points behind 3rd placed Ipswich Town. I’d still like to see a team from the division above thrown into the mix as it used to be the case when the play offs were first introduced into English football back in 1987. In that season Charlton Athletic had finished third bottom in what was then Division One, and then beat Ipswich Town, fifth in Division Two, to play Leeds United for the place in the top tier. After two 1-0 wins for the home sides, the game went to a replay which the Addicks won 2-1 after extra-time and thus retained their place in the top division. In the league below the story was slightly different as Sunderland were relegated from Division Two after losing a humdinger of a tie against Gillingham, who finished fifth in the third tier on away goals after a 6-6 aggregate score. There can be few things more dispiriting in football than being roundly beaten in the first leg of a play off game. On Tuesday night, Bromley FC, who had led the Conference South table for the best part of half the season, only relinquishing control for the last time in March traveled down the A2 to face Ebbsfleet United who only secured their play-off spot with two weeks to go. Bromley would have fancied their chances to have come away from Stonebridge Road with at least a draw, especially as their coach, Hugo Langton is a master of preparation and would have had a game plan nailed on. However, fate can sometimes be a fickle friend. Ebbsfleet opened the scoring after just 60 seconds and then less than ten minutes later Bromley’s Ashley Nicholls was sent off for deliberate handball and Ebbsfleet were 2-0 up from the resulting penalty. Two further goals proved the David Pleat theorists wrong in the perfect storm – i.e “Playing against 10 men is often harder than 11” and “2-0 is the most dangerous scoreline in football”. But Bromley do at least have a second bit of the cherry. Miracles do happen in football (just look at the fact Sam Allardyce is still in a job, or that Stoke City now play attractive football) so it was with the hope of a reversal of fortune that I planned my last Saturday of domestic action of the season. They were desperate to have a shot at the Conference Premier, having never ventured so high in their history. The excellent book, The Bromley Boys by Dave Roberts (coming to the silver screen soon) highlights the time when, in Roberts’s eyes, they were the worst team in England. They have got better since those days, and now with one of the finest Non League grounds in England, they had all their ducks in a row to have a crack with the big boys of the Non League. Ebbsfleet on the other hand were past masters of the Conference Premier. The one consolation they could take if they somehow lost this game was that they would have two local derbies against Dartford to look forward to, after the Darts relegation from the Conference Premier last weekend. But that would be a small moment of happiness. They drove up the A2, around the M25 and then followed the A21, making sure to watch the speed camera at the Michelin-starred Chapter One, with more than hope in their hearts. They could almost smell the final where Sutton United or Dover Athletic would be waiting. Bromley is only a bus ride away from TBIR Towers so it would be rude not to let such a potential momentous occasion pass by. The core of the LLF were also en-route, fuelled by Terry’s 50p off beer vouchers for Wetherspoon’s and the prospect of no footballing action in Sussex. 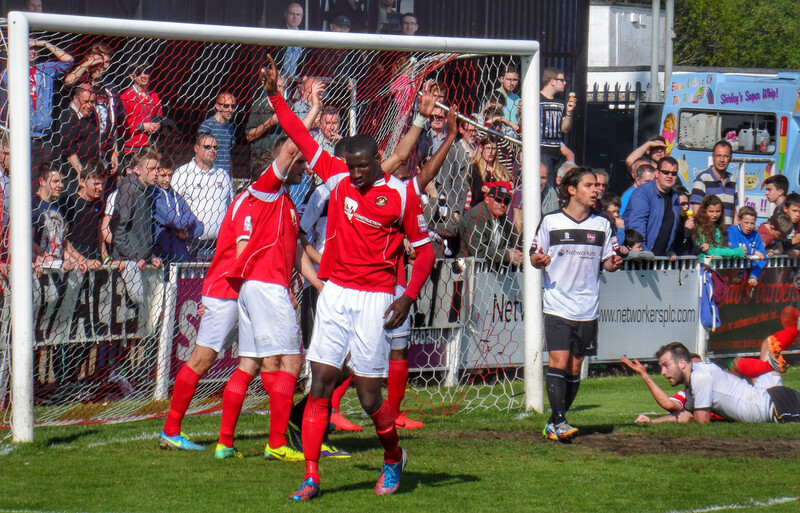 The sun was shining so it was undoubtably going to be the best day ever.Bromley 1 Ebbsfleet United 0 – Hayes Lane – Saturday 3rd May 2014This wasn’t a thriller to be honest. Both camps said as much in their post-match comments to the press. Bromley had to come out of the blocks flying and try to make an immediate impact into the four goal deficit. They couldn’t. The very big and strong Ebbsfleet defence held firm, using delaying tactics when they could to take the sting out of the Bromley momentum, whilst every so often using their wide men to push the home team onto the back foot. With a quarter of the game gone Ebbsfleet appeared to have taken the lead. A fifth goal over the tie would have had the fat lady on the pitch singing her heart out but the referee deemed that the scorer, Ben May, had used a hand instead of his head. Harsh from our angle. The scare seemed to shock Bromley into life and within two minutes they had taken the lead with a cracking strike from Danny Waldren. Every long journey starts with one small step – but would this be too little too late in the tie? Bromley really needed a second before half time to stand any chance of turning the tie around. Higgins went close with another strike from distance which Fleet keeper Edwards did well to push away but I think the visitors back four have had harder afternoons this season. The second half saw Ebbsfleet slowly start to press the Bromley midfield and thus back into their own half. The home side simply could create anything of note bar a Waldren header. Ebbsfleet could have had a goal themselves when the impressive McMahon fired his shot narrowly wide. A brief moment of hope appeared with ten minutes to go when Rance was given a straight red for his challenge on Goldberg but the numerical advantage lasted all of three minutes when Bromley’s Holland received a second yellow. Despite five minutes of injury time being played, Bromley knew the game was up. It had been a long, hard season where they had fought and won for the most part. Their fans stayed behind to salute the team, but the feeling of despair was clear to see as they slowly walked off the pitch for the final time this season. 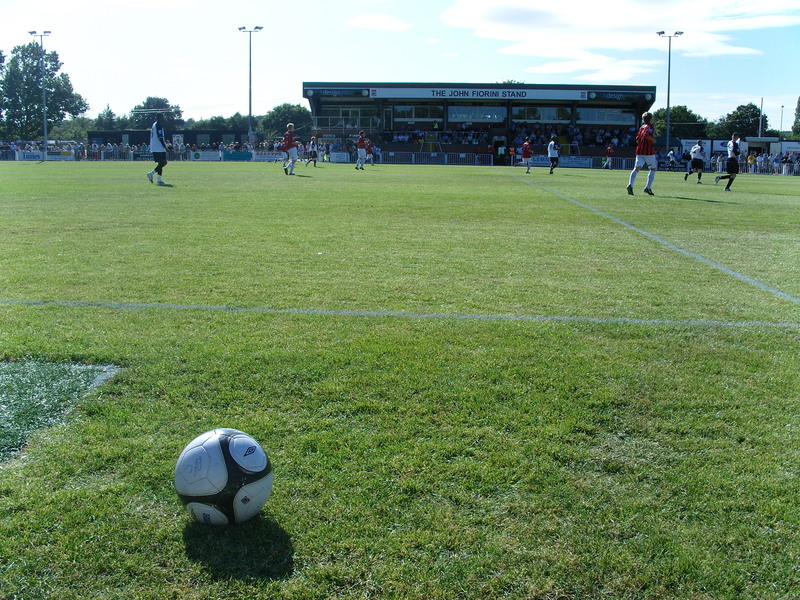 Ebbsfleet would now be hosting Dover Athletic in the Final, who had surprisingly beaten Sutton United 3-0 despite playing for 80 minutes with ten men.October 2010 – Bromley 1 Lewes 1Imagine a football manager agreeing to manage a club for free? What about one who willingly puts his hand in his own pocket to pay an overdue bill for the club? And then one who goes to his own board and suggests there could be a better man to take the club forward and is involved in the interview process? Pie in the sky right? Wrong! Late on Monday night the news was announced that Steve “Ibbo” Ibbitson was stepping down as manager of Lewes FC and would be replaced by ex-Croydon Athletic manager Tim O’Shea. In an interview with Guardian football writer, and long time Lewes fan Paul Hayward, Ibbo explained the reasons behind this and why it was the right time. “Too many people have sweated blood to keep Lewes FC going and surviving at this level for us to surrender our status easily. The Club needs new impetus to give us the best chance of staying in the BSS. In my opinion, this gives us a better chance of achieving that, at a cost which the Club believes it can afford.My last word as manager has to be to acknowledge the part my coaching team of Jason Hopkinson, Simon Gough and Dave Winterton have played in the survival of Lewes FC. In particular, for the last five years or so, Jason and I have stood shoulder to shoulder, fighting many battles, both on and off the field, on behalf of the club.Often, that has been with a team full of kids, who we’ve seen develop from 15-year-old schoolboys into young adult footballers. That brings a special sort of camaraderie and is something you never forget.” Despite the torrid start to the season that has seen the Rooks win just one league game and more often than not more players unavailable through injury than are fit, there was never any doubt that the new board would wield the axe. Ibbo had agreed that this would be his last season in charge and that he wanted to be part of the process to find his replacement. With funds in place to purchase some new players he felt now was the time to hand the reigns over to someone new. Dignity – no other word for it. Read any of the message boards and you will see the Rooks fans all saying “We believe in Ibbo”. He took over a virtually relegated team in March 2009 after a disastrous first every campaign in the Blue Square Premier. Last season, with significant financial pressure on the club that resulted in two winding up orders being presented he masterminded some end of season loan signings that saw the club win three of its last four games to stay up. Having a beer with him after the last day win at Hampton & Richmond in April he expressed no surprise that the club had manage to stay up, explaining that he had faith in the players and he knew they would not let him down. The people of Lewes responded by making him Lewes’s “Man of the year”. This season with a change in ownership Ibbo became much more open, readily agreeing to be interviewed by the directors on video for all to see and hear and including some very funny moments such as describing David Wheeler’s parasite and his reluctance to put him on the bench. We all have a choice on how we react to the circumstances around us. Watch any match from the Premier League/Football League and you will see the same reactions from the manager. “I did not see that incident”, “The goal was offside”, “It was handball”…managers are always the first to point the blame at someone else but never at themselves. In the past two seasons I have never seen Ibbo blame anyone for the performance of the team. We have seen some shocking referees in that time, some of whom have cost Lewes valuable points but not once has he spoken out. Again, there is dignity in that. The good news is that “Mr Lewes FC” is staying on. He will become Club Chairman, which I am sure will mean he can still wear his long shorts in all weathers around the club. The King is dead, long live the king as they say. Well, not quite. Ibbo had agreed to stay for one more game – a very convenient for me local match away at Bromley, re-arranged as Lewes had been in the FA Cup at the weekend. So the travelling Rooks fans could give him a send off. It was all set up so nicely for me as well. A bus trip to the ground, a couple of beers and even the appearance of (in)Active Matt. And then the Slovakian sausage struck. At some point during the weekend’s festivities in Hungary and Slovakia as part of Ocktoberfest 2010 I contracted food poisoning. Not just a mild case but a full blown, pack a spare pair of trousers for the flight home case. Forty eight hours later and 8 pounds lighter the contents of my stomach still seemed to be finding a way out. I was officially on probation from CMF – if I wasn’t well enough for work, then football was out of the window too. I resorted to taking tablets – something that never happens in my book just to try and get better. Bromley had started off like a proverbial rocket. Seven consecutive league wins saw them top the table into late September before three wins and finally a surprise 4-1 reverse at Basingstoke Town last week had seen them drop a place or two. Last season Lewes had simply not turned up for this game. On a hot August Bank Holiday they had lost 3-0 to the home side in a performance that would have had Ibbo hopping mad.Bromley 1 Lewes 1 – Hayes Lane – Tuesday 26th October 2010 Ah Hayes Lane, let me count the ways I love you. I recently chose Bromley’s ground as one of my 5 best non league grounds and on a chilly Autumnal night my opinion did not waiver. Stand on the open terrace that runs along the side of the pitch and look to your left and you will see a bench lined stand, to your right a terrace with a unique styled roof. Want a beer, head up to the modern bar where you can even watch the game from the windows. If only all grounds were like this..it was a shame not more fans felt the same way. Lewes’s travelling contingent of 12 included 3 of the Rooks125 who like real fan/owners stood on the terrace. A quick chat with the new manager, and his assistant Neil Smith yielded the fact we were almost next door neighbours in BR1 – a fact that could be quite handy when either of us has had a few too many Harvey’s after a game! The teams emerged with Lewes sporting at least two new faces and a formation that was unlike anything we had seen this season – in one word – attacking. Not only did the Rooks start on the front foot but there was also some bite in there. They were 100% committed into every tackle, chasing every loose ball and making sure every Bromley player knew this would not be a walkover they expected. With the new manager in the stands, and a debt to pay to the departing one, I cannot think what their motivation was! The game had a few interesting incidents which were viewed differently by both sides. The first in the 30th minute resulted in the opening goal for Bromley. 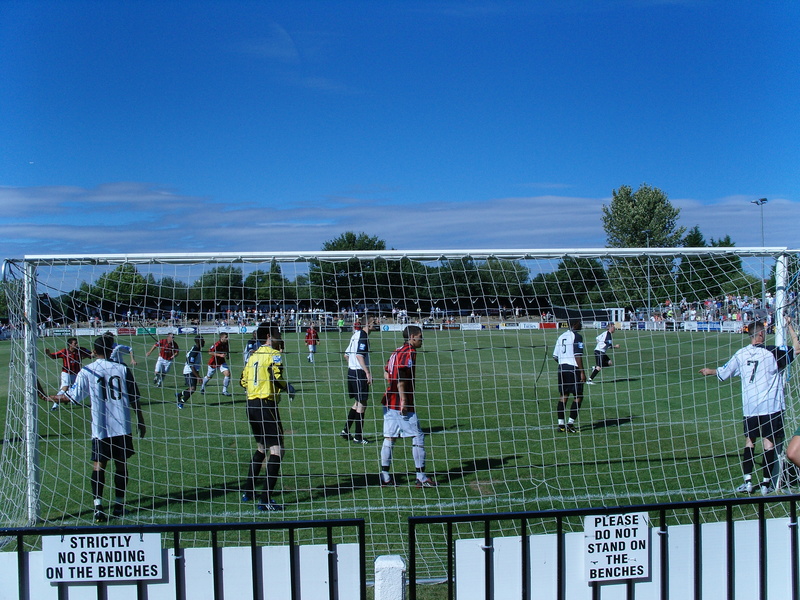 No one was doubting the mistake by the so impressive Winterton in the Lewes goal that saw Bromley’s Tony Finn lobbing the ball into an empty net from nearly 40 yards, but the Lewes protestations were about the initial through ball that saw a Bromley player clearly in an offside position. But all officials really understand active/passive offside right? I rest my case. A few minutes later a scuffle over a loose ball ten yards into the Bromley half saw all twenty outfield players involved in some girly pushing and shoving, with Ibbo chomping at the bit to jump into the action in his final game. The result yellow cards all round. Half time over and Lewes introduced some new blood. New striker Paul Olima had the ball in the net half way through the period but was again wrongly judged to be offside. It was a belter of a half – both teams wanting to score and defending became an irrelevance. Ibbo and Jason could simply stand back and almost say “look what we have done – it’s all clicked into place”. And then at last some reward. A complete mess in the goalmouth saw the ball apparently cross the line (according to the lino) but from who it is unclear. The Bromley keeper came out, ended up punching the ball against the bar, Rivers headed the ball into the empty goal but a defenders foot seemed to hook it back. Who scored? Who cares – 1-1 and to see one of the owners of the club jumping around screaming at the top of his voice must have been motivating for the players. Both teams had chances near the end and Rivers was millimetres away from sealing a famous win when he needed a Peter Crouch leg to get on the end of a fantastic Murphy cross. Bromley then had a free kick on the edge of the box in injury time. The Lewes Lunatic Fringe held their breath and the ball flew off a Lewes shoulder over the bar. And with that the whistle blew. Throughout the second half a teenager had been taunting the Lewes fans about our ineptness. He celebrated like mad that “we had only drawn with Bromley” until his mate pointed out that Lewes were from NEAR Brighton and NOT Brighton, and so a home draw against the bottom team who had lost every home game so far was actually nothing to brag about. So that was the end of the Ibbo era. He wandered back to the dugout to collect the kit bags (just like Wenger and ‘Appy ‘Arry do every week) and it was touching to see them share a private moment of chat before they headed back to the waiting throng of press. The players went off to meet the new management team, whilst Ibbo was presented with an old chum who used to play with him from his Scunthorpe days. As has become the habit this season Ibbo (and Jason) conducted their post match interview, in what was quite an emotional moment for all involved. Ibbo we salute you and wish all managers had a shade of the dignity you have shown everyone around you. Our last visit – Bromley 3 Lewes 0 – 31st August 2009Bank Holiday Monday. A British institution of visiting DIY stores and slaving over a barbecue signalling the last rites of Summer. It is actually statistically more likely to be hot and sunny than any other day in the summer despite it being over 60 days since Midsummer’s Eve (well according to the BBC weather statistics page anyway). So what did I have planned? Well a trip “down the lane” to watch Bromley v Lewes with the EFW team for starters (I’d actually been to B & Q four times the day before, attended two BBQ’s and even slipped in two trips to the tip to satisfy the traditionalists) Bromley are a bit of an enigma. Almost stuck at this level, yet one of the most progressive non-league clubs in the country. Forty years ago it had was very similar. Having just read the excellent “The Bromley Boys” by Dave Roberts on the 29th August 1969 the club lost 2-1 at home to Clapton, their 7th consecutive defeat in the Isthmian League. Fast forward forty years and the club are almost at home in the middle of the Blue Square South division. The club were actually formed in 1892 and were one of the founder members of the Southern League, which at the time was seen as the second level of English football behind the Football League. The club made a name for themselves in the FA Amateur Cup, winning it three times, the last time in 1949 when an amazing crowd of over 96,000 saw them beat Romford at Wembley Stadium. The club also recorded their highest ever attendance at Hayes Lane when over 10,000 crammed in to see them play a touring Nigerian team, who beat them 3-1 whilst playing barefoot! The club played in the Isthmian League for many years and unfortunately didn’t finish high up enough the table when the creation of the Blue Square North and South was announced in 2004, and consequently despite staying in the Isthmian they were effectively relegated. 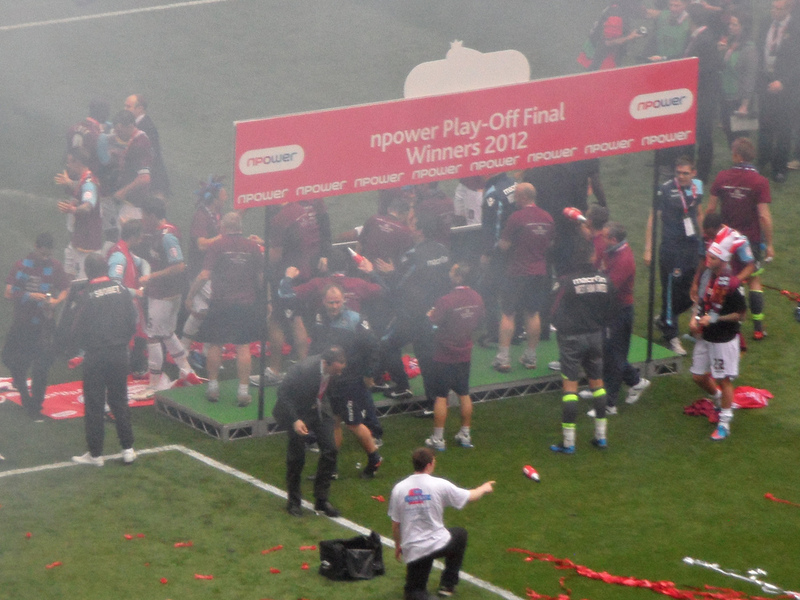 It took the club three seasons to regain their place in the second tier of non-league football after a penalty shoot out win in the play offs versus Billericay Town, having beaten AFC Wimbledon in front of a modern day record 3,429 fans. So in August 2007 the club kicked off their campaign in the Blue Square South under the leadership of Mark Goldberg, the businessman who had suffered huge financial pressures when he took over at Crystal Palace a few years previously. Goldberg was to leave half way through the season due to work commitments, but returned at the end of the season after the club finished safely in mid-table, a situation they repeated this season. Lewes came into this game with huge optimism. Despite a disastrous start to the season on the pitch, summed up by the last minute equaliser conceded at St Albans City last week, events off the field had turned out much more acceptable with the winding up order from the Inland Revenue now sorted out, and the club able to move forward in trying to stay in the division. Even more good news came in the form of TBIR’s sponsored player, Ryan Storrie had been included in the squad for the games over the Bank Holiday weekend. Whilst he hadn’t got on during the 2-0 home defeat to Woking on Saturday, he was sure to feature in the game against Bromley. Fuller Taxi’s dropped Lolly and myself at the ground for 1.30pm, and we headed straight into the ground. First impressions were good. Very old school and probably a harsh place to watch a game during the winter when the rain, sleet and snow blows across Norman Park, but in the lovely August sunshine it was a perfect venue. The basic view of the ground was completely opposite to the view in the club bar. A venue that would put many Football League grounds to shame. Excellent views of the pitch, a queuing system at the bar, a huge brunch for £3.50 and Bromley TV which shows highlights and interviews with the players done in a very professional manner (I should also add they have one of the best club websites I have seen in years). I can’t do the venue enough justice, so I will let my learned friend Mr Last picture the scene better here. With a heavy heart we left the bar and took our place on the benches behind the goal to cheer on the Rooks. Lolly was dispensed with the camera to be photographer for the day as I sat back to enjoy the sunshine. Strains of Take That songs drifted over the trees from the Bromley Festival (actually it was Fake That or Take This – a dire tribute band but what the heck). Lewes simply never got going and it was no surprise when a corner was not cleared and the big Aaron Dalhouse headed home with ease. Half time saw us back in the bar, trying to find some positives from the game. 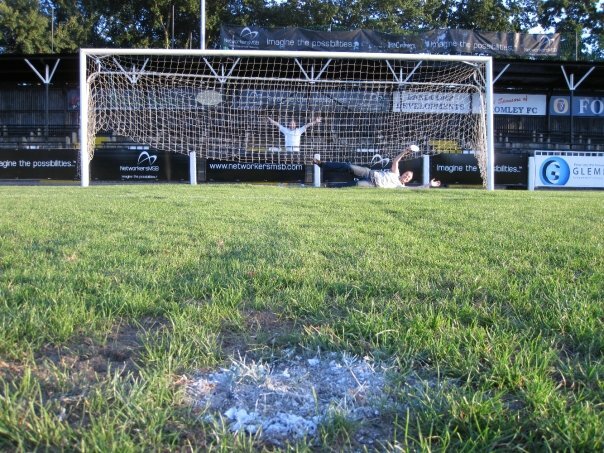 It was obvious that the heat was affecting some of the players, but it was the same for both teams and none of us thought Lewes could get anything out of the game, including Rog, the Lewes grounds man who had showed everyone in the bar a picture of his latest grass cutting display. Danny managed to convince him to burn (yes burn with petrol), the words Lewes FC onto the grass bank that runs alongside the Dripping Pan touchline, so if you do see a piece in the Argus this week about a fire at the ground you’ll know who to blame! The second half started with a bang. The bang coming from Deaks who, on leaving the bar saw the first glimpse of the afternoon of two would-be WAGS and walked into the door frame. The two looked very out of place, even on such a sunny day with orange tans, short skirts and little else in terms of modesty they paraded themselves around the ground, much to the amusement of the crowd. They were last seen in the bar after the game trying to corner a player or two. The game didn’t get any better for Lewes. Sam Crabb missed a glorious chance for Lewes before becoming the victim of another heavy challenge and he was replaced by Ryan, getting me at least a point. With Bromley now two up Ryan provided some much needed width and on a couple of occasions worked his way to the by-line and almost creating a consolation goal with a great cross which was well met by Wheeler but the keeper pulled off his only real save of the day. With the clock ticking down the impressive Dalhouse smashed in a third from twenty five yards after Ryan Hall had again teed him up. Ryan Hall, Ryan Storrie, Ryan Timms…..all around the same age….Eighteen years ago who was the “heart throb” of football – step forward Ryan Giggs, in all his hairy chest glory. Another honour for the Manchester United star surely. I still cannot fathom the explosion of footballers called Jermaine though. Defoe, Pennant, Jenas, Beckford to name but a few but apart from Jermaine Stewart in the Eighties who foolishly thought that you didn’t have to take your clothes off to have a good time (parties would have been really exciting around Mr Stewart’s house then!). Anyway, back to the bar and an appearance by CMF and Littlest Fuller who had been to Ikea all afternoon completed a Fuller family funday. There was still time for a bit of on the pitch high jinx, as Danny and Deaks reconstructed the famous Lewes penalty shoot out win from the 1983 season a la Phoenix from the Flames with me playing the crowd of a few hundred behind the goal. Fuller Taxis were on hand to whisk me home, with more than a few beers inside me, and glowing pride at some of the photos that Lolly took that would put mine to shame. The Boys of Summer may be over, but Weston-Super-Mare is on the agenda in a few weeks…It couldn’t get any better could it? I doubt it but we will give it a damn good go that is for sure.